Twenty Stories That Will Absolutely Run The Week 'Star Wars: Episode VII' Is Released Yesterday, Disney announced that it was purchasing Lucasfilm for four billion dollars and would be putting out new Star Wars films. The good news is that we already know what some of the headlines of 2015 will look like. 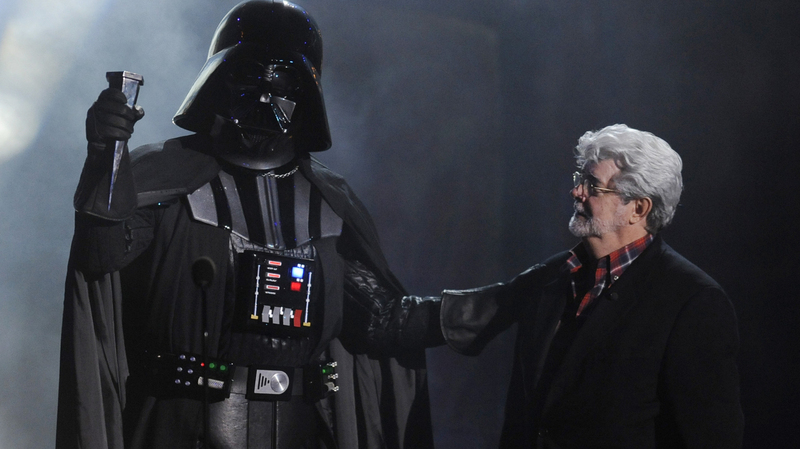 In this Oct. 15, 2011 file photo, "Darth Vader" accepts the Ultimate Villain award from Star Wars creator George Lucas during the 2011 Scream Awards. Well, now that Lucasfilm is being bought by Disney and a new set of Star Wars films is allegedly on the way, there's only one thing to do: look into the future and realize that we already know what a lot of the coverage will look like when the next film comes out in 2015. 1. Almost 40 Years After The Original, Four Generations Wait In Line. "Jeff Montgomery, 47, was just a boy when his father Ted, now 74, took him to see the original Star Wars. Now, he's back with his own son, Chris, 26, and Chris's new son Patrick, who, at a little over two years old, is a little young to appreciate Star Wars: Episode VII, but who's going with the rest of the family anyway — right after his nap." 2. Does Star Wars Still Matter? "In 1977, Star Wars set the cinematic world on fire. But that was before Indiana Jones, before Heath Ledger's Joker, and before last year's Robopocalypse and Tranformers 4. All these years later, can Star Wars penetrate with a new audience?" 3. The Hottest Women In The Star Wars Universe. 4. A Merchandising Bonanza: At Burger King, The Toy's The Thing. "Star Wars: Episode VII hasn't opened yet, but you can already purchase hundreds of products made to promote it, from masks to make you look just like the new characters to beer steins to let you drink out of the heads of the old ones." 5. The Real Trash Monster: How Much Star Wars Merch Will Wind Up In Landfills? 6. For The Men Behind The Original Star Wars Cantina, A Drink To TheFuture And A Toast To The Past. 7. Geeks Rule: This Time, We Really Mean It. 8. Ten Characters From Star Wars: Episode VII You Will See At Comic-Con. 9. A New Generation Of Star Wars Fans With A New Set Of References. "Steve Banks loves Star Wars, but when you ask him about his favorite character, you might be surprised. It's not Han Solo or even Darth Vader — it's Darth Maul. Banks is part of a new generation of Star Wars fans raised on the sequels and other offshoots of the Star Wars universe, not on the beloved original trilogy. And he insists he's just as much of a fan as anyone." 10. The Five Greatest Scenes In Star Wars History. 11. Ten Things That Are Better In The Prequels. 12. Twenty Dogs Dressed Up Like Star Wars Characters. 13. No, Really: Does Star Wars Still Matter? 14. A Galaxy Not So Far Away: For Star Wars, The Target Is The World. "The growing importance of international box office means that Star Wars isn't just the great American pop-culture phenomenon: now, it belongs to the world." 15. Beyond Princess Leia. "The Star Wars universe has always contained women — in fact, the toughest of pop-culture rebel princesses led the way from the start. What does the new film mean for women in Leia's shadow?" 16. How Mickey Bought The Empire. "In this five-part series, we look at the rise of Disney as an international entertainment mega-ultra-super-conglomerate, and how its acquisitions of the Muppets, Marvel, and Lucasfilm have affected the bottom line and the brands in which it's invested." 17. Shut Up And Enjoy It. "The internet is full of people whining about how everybody is dumping on their childhoods, which is exactly what happened when the prequels came out. It's time for people who call themselves passionate fans to get the [BLEEP] out of the way and stop trying to put their dead, bony fingers all over what their kids — sorry, their grandkids — are trying to enjoy." 18. Ten Things To Do This Weekend Instead Of Seeing Star Wars: Episode VII. "Contrary to what the clamor of popular media would have you believe, you don't actually have to see Star Wars this weekend. We've collected ten great family activities, from museum visits to reading aloud in a sunny patch of grass, that you can take part in instead." 19. Bread And Circuses, Without The Bread. "It's remarkable to witness the national frenzy over the release of a sequel to a nearly 40-year-old science-fiction trifle. Why, one must wonder, can we not whip up the same cultural frenzy to respond to our most serious global problems?" 20. Twenty Greatest "Yub Nub" Lipdubs.